Recommended Name: � the Modern Spanish Catalan pattern. This pattern was originally classified as S-1.12. It is recommended that this design be referred to as "Modern Spanish Catalan" to avoid confusion with French Catalan and with archaic designs from the same region, neither of which are closely connected with it. The design emerged with an identity of its own around 1850. It made no dramatic departure from tradition except in the shape of its cups. Barcelona popularised two distinct alternatives to the previously universal stereotype of this suitmark, one being an ornate urn with lid and handles and the other a hemispherical bowl with a short stem and flat base, like an egg-cup. The latter of these is featured in the Catalan pattern. 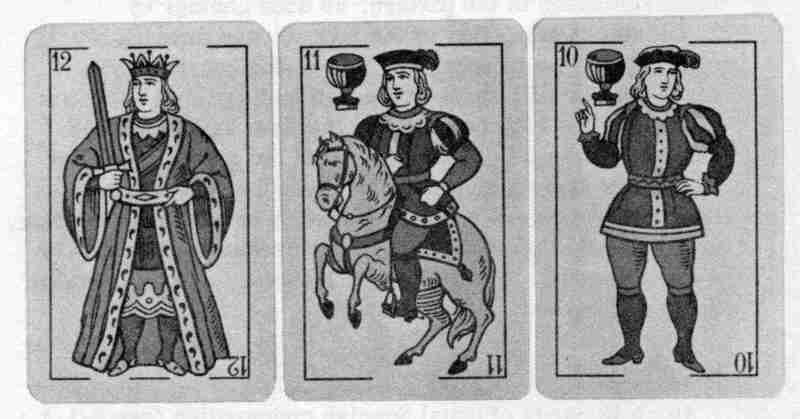 A design by Manuel Bertschinger (1833) contains several features later stabilised in the pattern, as does another by J. Sabates (1853); that of the jack of cups drawing his cloak about him is apparent, though the general style of the courts is still close to the National pattern. The last quarter of the 19th century and the first half of the 20th saw the design fully established and the greatest number of makers reproducing it. This was because most Spanish firms were then assembled in or around Barcelona, and naturally included among their products a design with a local flavour. The design is, however, used throughout Spain and beyond. 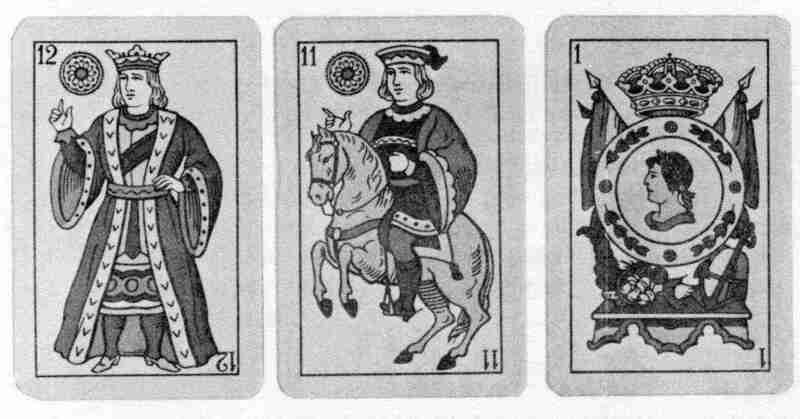 40 or 48 cards of usual Spanish composition (see S-1.1). Kings' calves on view below robes. All courts usually (but not invariably) clean-shaven, with bland, youthful expressions. 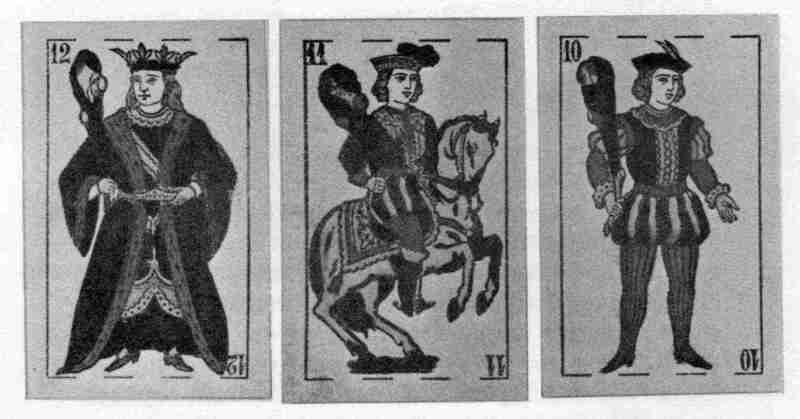 Jack of cups often wraps cloak around him with one hand. Cups shaped like egg-cups. Batons suit's court clubs of uniform shape. 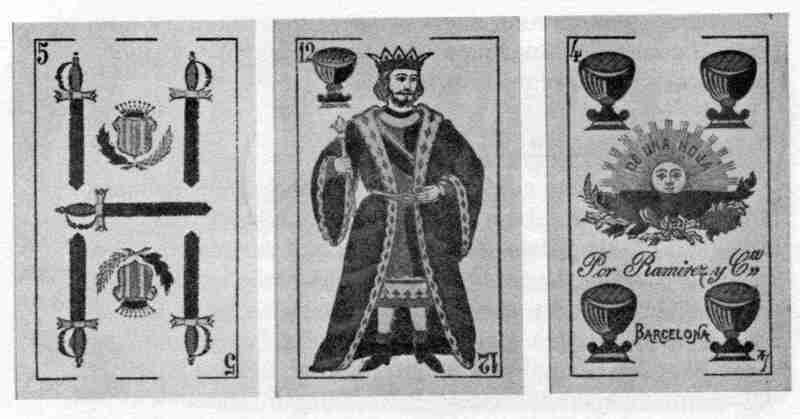 One of the numerical cards sometimes has Catalan arms or other regional symbolism. Ace of coins: crowned coin with flags, over decorative platform with mercantile symbols. Sebastian Comas y Ricart, Alejo Gabarró, Wenceslao Guarro, Ramirez, Juan Roura, José Samso, Torras y Lleó (all of Cataluña). When Gabarró, Guarro and Torras combined under the name of "Fabricantes de Naipes de Espana" (Barcelona) they continued to issue the design. lower two rows: Fournier of Vitoria, c. 1975.